← The Hebrides is a Fishing experience not to be missed! 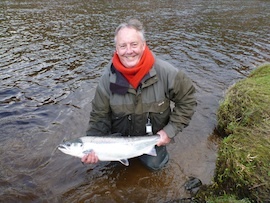 Tyne salmon rods enjoyed another record catch in 2011. The Environment Agency announced a reported rod catch of 5,663 salmon; this followed the previous record of 5,115 salmon reported in 2010. Please note that this is the RECORDED catch. Records are constantly changing on the Tyne, this years count of 144 salmon over the fish pass in March was another. To date over 370 salmon have ascended the counter to date, many of the these fish are three sea winter salmon. The Kielder Burn smolt trap has also established a new record, last week (10th April 2012) 3,700 smolts were trapped in a single day, this is the largest day run since trapping began and it created a lot of work for the hatchery staff who had to fin clip every fish. The salmon smolt count at the trap is the largest count to date with 6,700 salmon smolts recorded and hopefully more to follow. More beats and availability has been added during the last 2 weeks for the River Tyne.